AS-path: A list of the Autonomous Systems (AS) numbers that a route passes through to reach the destination. As the update passes through an AS the AS number is inserted at the beginning of the list. The AS-path attribute has a reverse-order list of AS passed through to get to the destination. Next-hop: The next-hop address that is used to reach the destination. Origin: Indicates how BGP learned a particular route. There are three possible types — IGP (route is internal to the AS), EGP (learned via EBGP), or Incomplete (origin unknown or learned in a different way). Local Preference: Defines the preferred exit point from the local AS for a specific route. Atomic Aggregate: Set if a router advertises an aggregate causes path attribute information to be lost. Aggregator: Specifies the router ID and AS of the router that originated an aggregate prefix. Used in conjunction with the atomic aggregate attribute. Community: Used to group routes that share common properties so that policies can be applied at the group level. 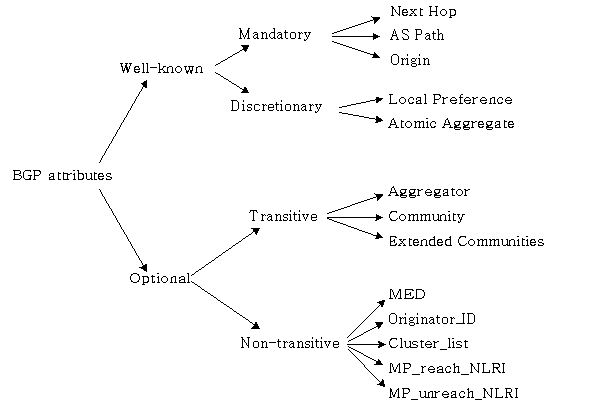 Multi-exit-discriminator (MED): Indicates the preferred path into an AS to external neighbors when multiple paths exist. Attribute length field that is 1 or 2 bytes,and a variable length attribute value field.